Gill Castle's life has changed dramatically. She has lost a staggering 9st126lbs57kg - the first 4st 7lbs63lbs28.5kg under her own steam, then a further 4st 7lbs63lbs28.5kg stone after joining Nutracheck. She'd retired on grounds of ill health, but now is an absolute exercise addict who no longer needs walking sticks to hold her up. 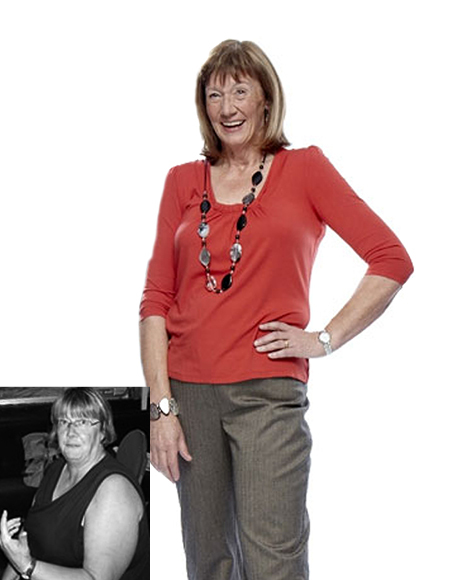 Read her inspirational story of a total lifestyle change. I was ill. I'd had to take early retirement on health grounds because of my Multiple Sclerosis. I used walking sticks and had to hold on to things as I had no balance. My husband is disabled and I suddenly realised that if the ambulance needed to take me to hospital, they'd need to call on firemen to move me! Something needed to be done. I heard about Nutracheck at the gym. I tried it and loved the food diary, the exercise log and the support in the forums. One of the best things about the food diary is that you can enter your own recipes and Nutracheck works out the calories per portion. There are masses of useful resources too. I particularly liked being able to record all the data - my weight, measurements etc - in one place where I wouldn't lose it! Have you tried other diet plans before? I've lost weight on diets in the past, but then I've stopped dieting and that weight, plus more, has gone back on. That was the problem, they were diets and diets end! This is a total lifestyle change, and that's why it's worked. My life now is completely different! I feel liberated. What's been the key to your dieting success? Erm, excuse me, I'm not on a diet! I can eat anything that I want to, but what, and how, I eat has completely changed. EXERCISE! Before I started this, I had never done exercise and hadn't got a clue about how many different ways you can. I didn't know that the correct exercises could address my balance problems. Now I can't imagine not eating proper food and exercising regularly. I know that I can eat anything I want to, I might just have to work a bit harder to burn it off! What's your key piece of advice? Exercise, exercise, exercise! Get a personal trainer if you can. I used to teach and was a total workaholic. Fitness is what I do now. It's replaced my work and gives me balance. The more I discover that I can do, the more I want to do. Training sessions astound me. I discovered that I could skip in one session and couldn't believe it! My personal trainer, Darryl Stone, has made me enjoy exercise. Darryl says, "As Gill's body has shrunk, so her personality has grown!" He believes that she's different from many of his other clients as she works on her own, not just during their PT sessions. He says "Gill treats exercising as part of her whole lifestyle change - it's not just an hour with a trainer". How do you feel now compared to before you started the plan? 100 years younger! Liberated. And the hospital now think my MS has become benign!!! !